It was such a pleasure working with Jaclyn and her talented String Quartet! My husband and I reached out to Jaclyn a year before our wedding, and from the very first email, Jaclyn has been nothing but responsive and helpful. We communicated frequently throughout the planning process, and Jaclyn was able to make excellent suggestions from timing, logistics, to song choices. She was by far the easiest vendor to communicate with (and we've had amazing vendors!). We requested a particular arrangement of the song "Chasing Cars" by Snow Patrol to be played during the procession, and they absolutely nailed it! They have fulfilled every wish we had, and set the perfect tone for our day through their music. 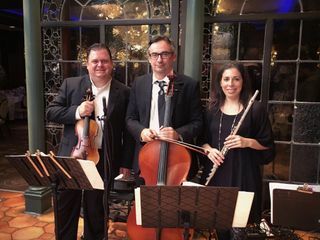 The quartet created the perfect ambiance for our ceremony, and I would highly recommend Jaclyn Duncan Music to anyone looking to elevate their special occasion! I booked a string trio from Jaclyn Duncan Music. Jaclyn helps a lot when we chose music list. The musicians were on time and played wonderful music. What's more, they have took some gorgeous photos for us! Strongly recommend! Jaclyn was super sweet to work with and professional. She gave me advice as to what music to choose. Her musicians were affordable and professional and I got to see them twice as a friend of mine had them as well at her wedding. Our cellist was punctual and very kind. The music was wonderful. Thank you Jaclyn Duncan Music! Jaclyn runs an amazing operation. She was so easy to work with and her roster of musicians is so incredibly talented. Together they elevated our ceremony to a level we didn't know was even possible. Beautiful music, fantastic company, unparalleled service. Can't recommend enough!!! Jaclyn worked with me to find something in my budget and understood when things changed last minute. The performers were wonderful and exactly what we wanted. Highly recommended. I'll be honest, I'm the groom so day of, I think I might've heard the first bits of our first song before walking down the aisle with my folks and everything just went quiet for me until I had my bride in my hands. THAT being said, I cannot even begin to express the praise Jaclyn Duncan Music received from friends and family for their performance through our wedding and our cocktail hour. They did such a phenomenal job, and the cost is well worth the service they provide. They made our day so much more special and we cannot thank them enough! Jaclyn & Team were WONDERFUL! They had the perfect song selections and made it incredibly easy to choose ceremony music for our big day. We loved their sound and their ability to curate the most romantic and joyous ceremony imaginable. We definitely recommend them to anyone seeking a perfect wedding day! Did an absolutely amazing job! Great communication leading up to the event. Both timely and extremely helpful. Would highly recommend! We found Jaclyn just 7 weeks before the wedding, only because we lost our first ceremony musician. I’m actually very glad that it happened because working with Jaclyn has been nothing but pleasant, efficient and satisfying. Her songs selection/list is absolutely great. They even have video games theme songs which is perfect for us since my husband is a big fan of video games. Our friends noticed the video game theme songs playing during the cocktail hour immediately! We had them playing the Beatles and Hail & Oates for the ceremony and they sounded so timeless and romantic. We told her that we really like Blackbird by the Beatles. Jaclyn and her team, Talia, learned it and played it at the ceremony as the song for the bridal party entrance and we absolutely love it! On our wedding day, they were being punctual. Ended up working with Jaclyn was one of the best things that happened to our wedding. Great Musical Team and Talent! From our first interactions with Jaclyn to our wedding, she has been extremely helpful in making sure we have the music that we wanted for our wedding. 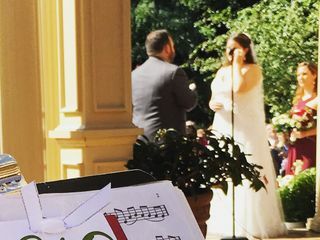 We had a great team on our wedding day and our guest were very impress by the variety of music played from the Beatles to Ed Sheeran and more! Jaclyn and her team are not only talented but also highly professional. We are very glad we had them as a part of our wedding! Jaclyn and her team performed at my church ceremony for my wedding on 8/12/18! They did an amazing job! All our guest commented on how great the church music was! It was truly one of the highlights of our wedding. I had requested two special Coldplay songs to be played during the ceremony as they are special songs to my husband and I. They played both songs beautifully!!! 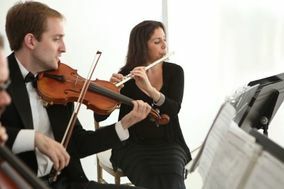 They entire process of working with Jaclyn and having the music at our ceremony was simply perfect. I would highly recommend Jaclyn for your wedding!! The music was so beautiful. The musicians were so talented. They planned all my favorites, Bruno Mars marry you, Hallelujah, Clocks by cold play and the theme from legend of Zelda. A week before the wedding I asked them to play a song by Swedish house mafia and they did an amazing job. Really easy to book and their website is really great with all the samples. I didn't even have any questions. I would definitely recommend them to any friend of family. My wedding was on 7.21.18. Loved it! Hired guitarist and violinist for wedding ceremony and cocktail hour. The musicians showed up early and were excellent. Jaclyn was also excellent to deal with. She responded to emails promptly and made recommendations. Jaclyn Duncan's team was incredible. 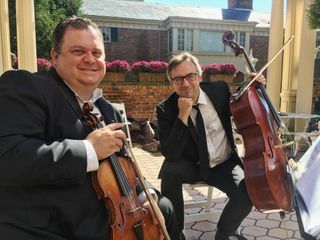 We hired both a classical string quartet for the ceremony and jazz quartet for the cocktail hour. We had so many compliments from our guests (including a musician, who had played many weddings herself). Jaclyn also arranged a hymn specially for our wedding. She was one of our very favorite vendors! I was so happy with the musicians at our Gainesville, FL wedding. Our guests loved the music, and it allowed them some wonderful entertainment before the ceremony! The musicians were very professional and talented. I was extremely impressed with Jaclyn and her quick, detailed responses to emails. The experience was perfect from start to finish! Great musician to work with. Helped advise me on ideal selections! Punctual, and a beautiful performance. Charming and pleasant on the day of the wedding. I recommend highly. Jacyln and Kevin were amazing at my wedding and I couldn't have asked for a more amazing accompaniment for walking down the aisle. Jacyln answered my emails and calls within hours and gave me a quote right away. She does top quality work for such an amazing value and I would highly recommend her and anyone who she thinks would work well with her. We hired Jaclyn Duncan music for our ceremony on 9.22.17 and they were AMAZING! We received so many compliments on the music! I highly recommend using Jaclyn Duncan Music if you're looking for magical, elegant music! 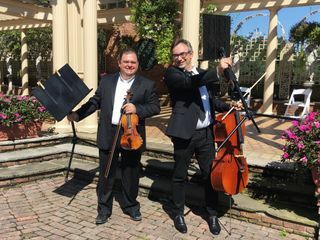 I hired 2 violinists and 1 cellist for my wedding ceremony (Church) and it was SUCH a hit. The second I heard the strings play the processional music, I started to cry! They were extremely professional, easy to work with, and so incredibly talented. Hiring them was one of the best decisions I made for my wedding ceremony. Thank you so much, JD team! 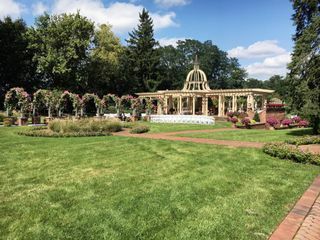 We recently got married in West Orange, New Jersey at The Manor on May 21st and OMG! I am soooo In LOVE with Jacklyn Duncan's Music. My entire experience with her was AMAZING. From the minute I emailed her to the final day I had to submit my music list. She was so easy to work with. Their performance during the wedding was absolutely beautiful. 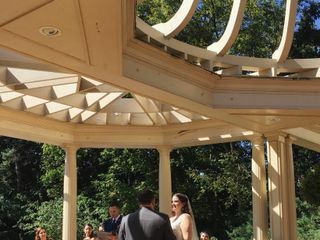 My husband and I were only able to hear them play during the ceremony but all our guests talked about how good their music was during cocktail hour. If I have another event, I will definitely use them!! Thank you so much Jacklyn! Jaclyn and Patty were absolutely wonderful playing the harp and flute for our wedding! 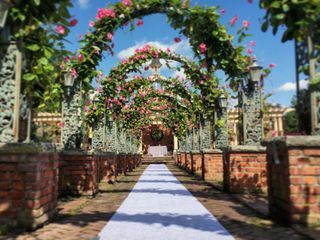 We had an outdoor wedding and they came early as promised for setup. They played beautifully. Upon booking them for our big day, Jaclyn was super responsive to all my emails and flexible with the music selection we requested. Thank you so much Jaclyn and Patty! The best harpist and flutist we could have ever asked to be a part of our ceremony! Jaclyn was so easy to work with and was so great at our ceremony. Would recommend to anyone, a real pro. I found this vendor using the website "GigMasters." I appreciated the vendor contacting me via phone for our initial consult. This vendor is very reasonably priced and delivers top notch services! Jaclyn is very personable and easy going. She answered all of my emails promptly and made sure all the details of the ceremony were taken care of. I had a violin and cello duo play during my ceremony. After searching many vendors, I'm so happy with my choice of Jaclyn Duncan music. We had absolutely beautiful music at our ceremony provided by Jaclyn Duncan! The musicians were very professional and added a very special touch to our day. Getting to hear one of our favorite songs as we exited our ceremony was very cool! I would highly recommend Jaclyn and her colleagues to anyone!